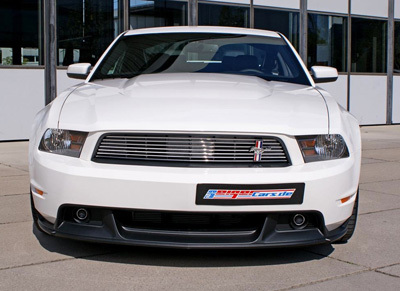 Bavarian importer and tuner GeigerCars released it's 2011 Ford Mustang supercharged pony car for enthusiasts in Europe. If you've been watching Supercars Exposed or one of the other exotic car TV shows, you've probably heard of the wickedly fast American cars tuned by Geiger. Geiger's stock and trade is importing and converting popular impressive US makes, converting them to TUV standards. Even more fun, their prowess at increasing performance to supercar standards puts them a step ahead of most of the competition. So what do you get in a 2011 Ford Mustang Supercharged by Geiger ? Although the 2011 Mustang already has a decent suspension, the car has had to make compromises between handling and ride. Geiger has upgraded the ride with it's sports chassis and reduced unsprung weight using very lightweight OZ Ultraleggera light-metal wheel rims. These slick rims are shod with 245/35R20 at the front and 38530R20 high performance tires at the rear. Adding to the already powerful new 5.0 liter coyote engine, the folks at Geiger added a 2.3 liter supercharger to the mix. With a conservative level of boost, the Bavarian Mustang cranks out 497 horsepower at 6,400 rpm. Unlike North America, there are places in Europe where you can see where the far end of the speedometer goes. So for the 2011 Mustang, Geiger has removed that nasty speed limiter, allowing the car to reach an incredible 170 mph (274 km/h). Similar to what you'd see with other tuners, such as Roush, the price is a combination of the price of the imported and converted car, plus the performance additions. Not cheap, but if you want something fast and out of the ordinary to tear up the streets of Europe, you can't go far wrong with the Ford Mustang 2011 Compressor. It'll be interesting to see their take on the 2011 Shelby GT500.